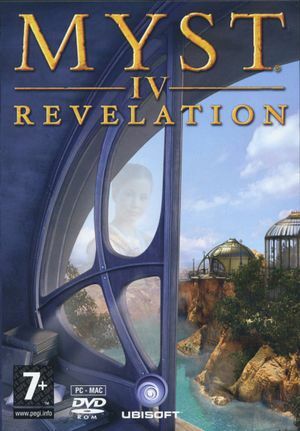 The DVD-based version of Myst IV attempts to install Safedisc DRM on a computer. This will prevent the game from running on Windows 10. Install patches from Ubisoft before attempting to play or launch the game. A no CD crack is required to play under latest Windows. Warning - website has a lot of ads. Use the "hoodlum" patch to remove Safedisc. These NoCD patches are quietly accepted/allowed by Ubisoft moderators, since they never released a patch to the game to remove the Safedisc. Game will not launch without administrator permissions on Windows. For the Mac, there is a "universal" installer that makes a hybrid native + wineskin version of the game. The game runs native on 10.5 and earlier (PowerPC, runs through Rosetta on intel Macs) and Wineskin on 10.6 and later. Resolutions other than 4:3 will crop the top and bottom of the game potentially obscuring information. Apply the Windowed patch below. Set the resolution in the game's options menu to 800x600. Change the values as desired. If Windowed is set to 0, then the resolution must match the monitor's. Create a file in <path-to-game>\data named game.dsc.txt. Rename the file to game.dsc. ↑ 3.0 3.1 File/folder structure within this directory reflects the path(s) listed for Windows and/or Steam game data (use Wine regedit to access Windows registry paths). Games with Steam Cloud support may store data in ~/.steam/steam/userdata/<user-id>/925940/ in addition to or instead of this directory. The app ID (925940) may differ in some cases. Treat backslashes as forward slashes. See the glossary page for details.